The past 15th October 2014, the first international conference on MENA refugee children took place in Sharjah, United Arab Emirates (UAE). The conference aimed at developing the necessary mechanisms to ensure the protection of refugee children and youth in the Middle East and North Africa region and ensuring their most fundamental rights, such as right to shelter, food, healthcare, psychological rehabilitation and education. The two-day conference was hosted by the United Nations High Commissioner for Human Rights (UNHCR) in partnership with The Big Heart. The conference held upon the invitation of Her Highness Sheikha Jawaher bint Mohammed Al Qasimi, Wife of the Ruler of Sharjah and UNHCR Eminent Advocate for Refugee Children aimed to reckon the increasing number of refugee children in the region. The conference opened with a policy forum which included influential speeches from the most significant representatives of the conference; the second day passed around the theme ‘Participation for Protection’, using panels and round tables as a way to share knowledge and to engage in constructive debates. The conference provided a platform for over 300 international figures that participated, including governmental representatives, international organisation leaders, lawyers, academics, and other experts from the MENA region. 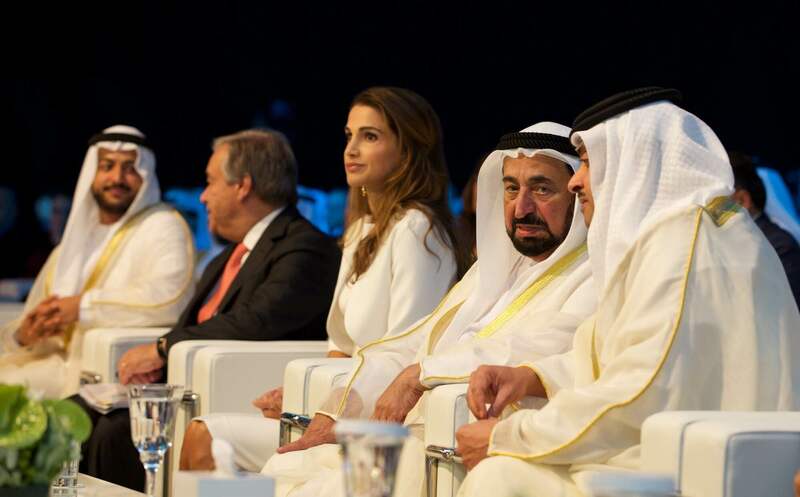 The list of dignitaries, VIPs and senior officials who attended the conference included Her Majesty Queen Rania Al Abdullah of Jordan who delivered a keynote speech on the opening day; Mr. Antonio Guterres, United Nations High Commissioner for Refugees; Sheikh Nahyan bin Mubarak Al Nahyan, Minister of Culture, Youth and Community Development, Dr. Nabil Elaraby, Secretary-General of the League of Arab States, Pierre Krähenbühl, Commissioner-General of UNRWA, and Lynne Featherstone, DFID minister, UK. The conference was opened by His Highness Sheikh Dr. Sultan bin Mohammad Al Qasimi, Member of the Supreme Council and Ruler of Sharjah, where Mr. AlQasimi delivered with a powerful opening address, stressing that there had been many conferences as matter to human nature and human values adopted by all peoples of the world, regardless their identities and civilizations. “Those conferences have resulted in many international conventions, legislations and local laws which highlight the rights of children and young adults for protection from assault from all types and sources, as well as comprehensive care, especially cultural, healthcare and educational care, so that they grow up safely and contribute to the creation of the future and prosperity of their communities wherever they are”. The Queen Rania Al Abdullah of the Hashemite Kingdom of Jordan, one of the recipient countries of Syrian refugees at the moment, also pronounced a powerful speech: “The number of people who left their homes exceeded fifty million for the first time since World War II, and Syria is the most affected” she recalled. In the panel discussion of the second day of conferences titled ‘Partnering for Protection of Refugee Children’, experts from relevant agencies, private organisations, public sector in the UAE, media fraternity, and scholars discussed how the different stakeholders could collaborate jointly as partners and how it could ease the refugee problem in the region. The panellists emphasised the importance of collaborating with the private and public spheres in order to protect and to care about refugee children. As a result of the conference, at a closing session held on October 16, it was presented to all participants and the media a document containing a set of principles on the protection of refugee children and adolescents in the Middle East and North Africa. His Excellency Sheikh Nahyan bin Mubarak expressed his gratitude to Her Highness Sheikha Jawaher bint Mohammed Al Qasimi, for her efforts in supporting and protecting refugees in the region. He highlighted the need of a special care for refugees since they constitute part of the next generation in the region. At the same time, ‘Investing in the Future MENA Youth Forum’ was held along with the conference and drew 100 schools and universities across the country. Discussions were held on challenges and difficulties suffered by the international agencies while working with refugees in the region. The main objective was to engage youth from the region to understand the challenges of forced displacement within the MENA region. Over 51 million people worldwide have been uprooted by conflict and persecution, and last year, more than 32,000 people were forced to flee every day. The number of refugees in the MENA region is over 3.8 million; over 3 million are Syrian, and 1.8 million are children. The number is expected to reach 2 million children by the end of the year 2014. Syrians are by far the largest refugee population under the UNHCR mandate today. These are only surpassed by Palestinians which are over 5 million refugees, the largest group in the world, who find themselves under the mandate of United Nations Relief and Works Agency for Palestine Refugees (UNRWA), which it should not be forgotten that some of those Palestinians who were refugees already in Syria, are becoming refugees for the second time in their lives. All of the countries in this region have embraced the protection of children through their ratification of the Convention on the Rights of the Child that celebrated its 25th anniversary in November 2014. 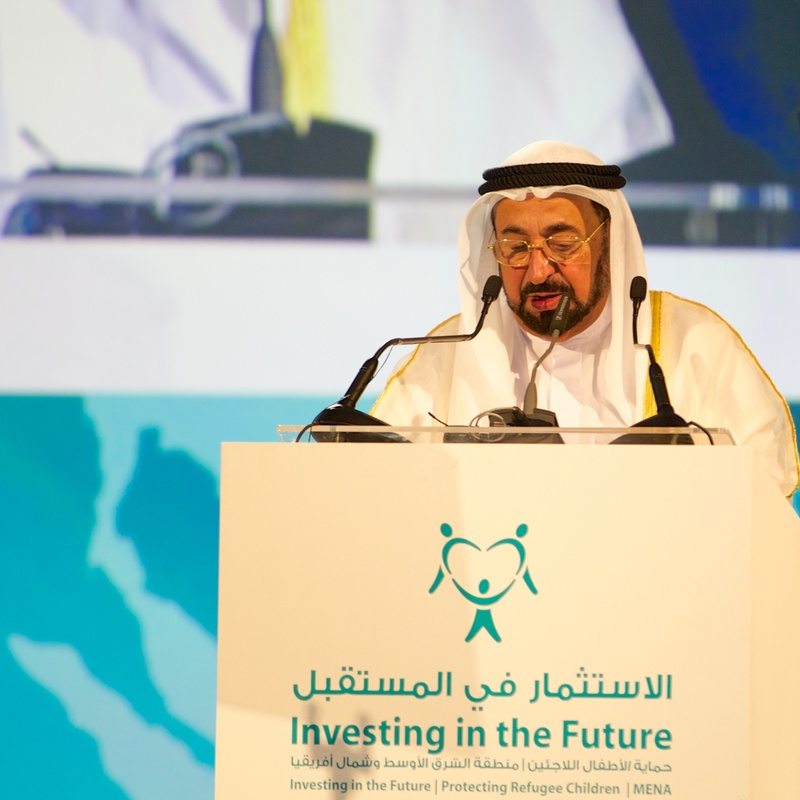 Representatives of States and governments, together with representatives of international organizations and civil society, met in October 2014 in Sharjah, United Arab Emirates, to jointly address the situation of refugee children in the Middle East and North Africa. 1. All refugee children and adolescents to enjoy international protection. 2. All refugee children and adolescents to have their best interests taken as a primary consideration in all matters affecting their well-being and their future. 3. All refugee children to be registered and documented at birth in countries of asylum. 4. All refugee children and adolescents to enjoy their right to family unity and be protected from family separation. 5. All refugee children and adolescents to enjoy their right to quality education in a safe environment supportive of their developmental needs. 6. All refugee children and adolescents to be protected against violence, abuse, and exploitation, including child labour, and have access to national systems and services delivered in a protective way, including health and psychosocial support. Launched by Her Highness Sheikha Jawaher bint Mohammed Al Qasimi, Wife of His Highness the Ruler of Sharjah – UAE and UNHCR Eminent Advocate for Refugee Children in June 2013, the Big Heart for Syrian Refugee Children campaign works to relieve the plight of Syrian refugees with specific focus on the needs of children. Having already raised US$14 million in its first year and contributed to meeting the needs of hundreds of thousands of Syrian refugees through the provision of emergency healthcare, clothing, blankets, shelter, and food, the campaign’s focus has recently been turned from emergency relief to education, as part of the efforts that aim to bring Syrian refugee children back to school to complete their education after being forced to flee their war-torn country. The Office of the United Nations High Commissioner for Refugees was established on December 14, 1950 by the United Nations General Assembly. The agency is mandated to lead and co-ordinate international action to protect refugees and resolve refugee problems worldwide. Its primary purpose is to safeguard the rights and wellbeing of refugees. It strives to ensure that everyone can exercise the right to seek asylum and find safe refuge in another State, with the option to return home voluntarily, integrate locally or to resettle in a third country. It also has a mandate to help stateless people. Read more post about UNHCR here.